In 2013-2014, the hotel booking system, HRS company (founded in 1972) awarded "Zarina" hotel with insignia. It means that our hotel for two years already lives up to your expectations, meets the quality standards and it is focused on customers. Special thanks to our guests, without you we would not have received such a high award! In 2014, we participated in Russian Hospitality Awards 2014 (Ceremony awards among top representatives of hotel business in Russia). We chose the nomination Business Hotel 3* and passed the qualifying round, becoming a full-fledged "nominee in Russian Hospitality Awards 2014". It is a great honor for our hotel to participate in such a large-scale annual event. It has been two years since the largest reservation system Booking.com confirms that we are one of the most frequently booked hotels in 2013 and 2014. What does this mean? This means that our guests choose us in this booking system based of various criterias like: our location, low prices and of course, good reviews (and we do have many). We try to keep and improve our level of service. 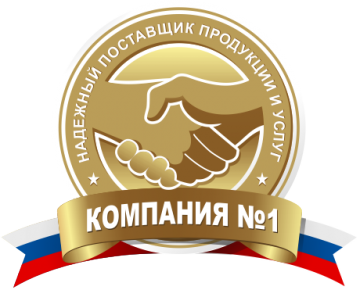 Hotel and restaurant complex "Zarina" became a winner of the annual national award COMPANY №1 ;and received the title of "reliable supplier of products and services"! ;Annual national award in the field of business image, social reputation and credibility "COMPANY №1» - in 2015 with the award of honorary title "reliable supplier of products and services"
In 2015 "Zarina" hotel received a certificate of quality TRIPADVISOR 2015. For the last five years this award is gained for high standards of service in the hospitality industry, marked only those companies that consistently receive excellent ratings from travelers trough online platform TripAdvisor.ru. We thank all our guests who have found time to leave their comments, and say 'thanks' to the team of our hotel with the best wishes and new victories!